Over the past few months I have been building a set of Actions in Photoshop in order to help with automation of my patterned works. I don’t like the idea of using an app or someone else’s work methods, so it was important to me to start from nothing then conceptualize and build each one by hand. As you can see in this image, I have created a LOT of Actions so far, each to do something different and specific to the photograph. 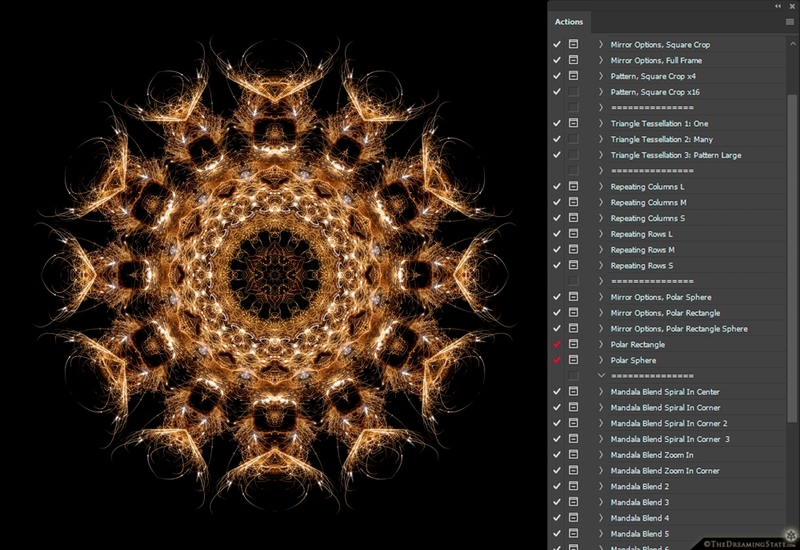 My workflow involves running one, two, or many of these Actions in different ways, then starting over if I am not happy with the outcome… This is a long exposure photograph of sparklers, mirrored, blended, and formed into a highly complex patterned mandala.